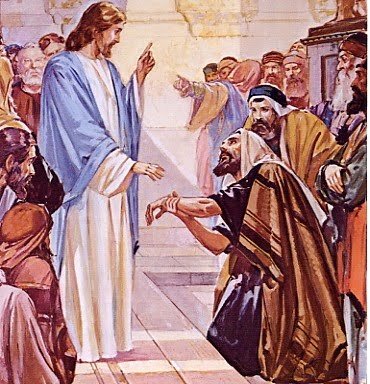 In Mark 3:1-6 (Luke 6:6-11) we read that Jesus was in the synagogue at Capernaum on the Sabbath and saw a man with a withered hand. Tradition says that the man was not born that way, but had been injured as a stone mason. The religious leaders were watching Jesus carefully- almost like they knew what he was going to do and couldn’t wait so they could add to his rap sheet. We can see from the context in Mark (and Luke) that they already had a beef with Jesus about the Sabbath issue. Sure enough, Jesus intentionally drew attention to the man by asking him to come to him. Luke’s version says that Jesus knew their thoughts so he asked a question of the Jews which got to the heart of the Sabbath law and the entire system of Jewish oral tradition. “Is the Sabbath a time to do good or evil; to save life or to kill?” When you put it like that it was a no-brainer. They didn’t know what to say- they were on the horns of a dilemma. The Pharisees knew that the law was for doing good and for preserving life, but if they agreed they would be giving Jesus a justification for healing this man. They were so hardened and blinded by their traditions that they completely missed the spiritual intent of the law; to love God and neighbor. Jesus was angry at their willful ignorance—using the very law of God to hide compassion and shun justice. So he healed the man by saying, “Stretch out your hand.” I wonder if the man thought, “But Lord, this is the precise thing I cannot do- that is why I’m the guy with the withered hand.” However, as the man believed and acted upon the word of Jesus by stretching forth his hand, he was healed. This is my third installment and final impression of my trip to Ethiopia with Compassion International. The picture on the left is of a 22 yr-old young man whose name is Beretek, (means blessing). He graduated from a university in northern Ethiopia with a 5-yr degree in Architecture and just started his first job as a free-lance architect. He was a Compassion sponsored child who grew up as one of seven children raised by his mother in a slum in Addis Ababa. His father died when he was an infant. He is a Christ-follower and active in his local church working with the youth. 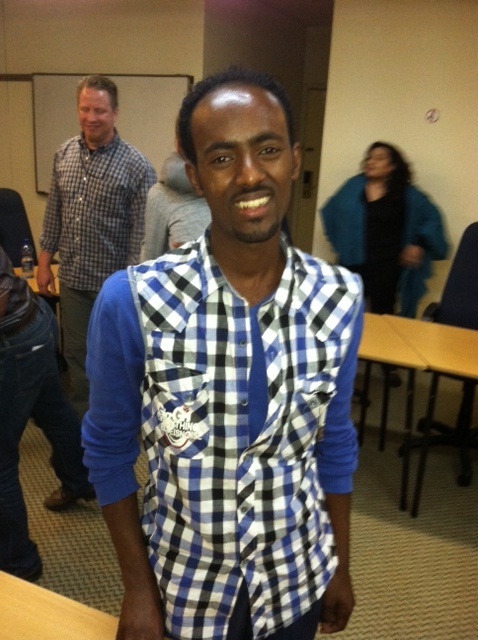 He is one of the 240 Ethiopian Compassion students (and 2,000 world-wide) who competed and qualified to be accepted into Compassion’s Leadership Development Program (LDP). The purpose of the LDP ministry is to provide “an opportunity for outstanding young women and men, who have been assisted by Compassion in the Child Sponsorship Program, to develop their potential as Christian leaders and contributors in their spheres of influence.” This opportunity is in the form of scholarships provided by sponsors and donors to enable these students to attend a university and to take positions in their society that will change the nation. I believe that what I saw the night Joel Sisson and I had dinner with Beretek was a miracle: a young man born into poverty with no way of escape except for the committed Christians of Compassion. The miracle is that he has not only broke the cycle of poverty, but he has received an education and skills to help his nation escape from poverty. Dr. Wes Stafford (past president of Compassion Int’l) used to say that people may born in poverty, but poverty is not born in them. I love the perspective with which Ato Getu Amare (LDP team leader in Ethiopia) challenged the 2012 class of LDP graduates: “Forgetting the life path that you went through and what God has done in your lives will invalidate all the efforts exerted upon you. Therefore, I urge you to think about your past miraculous adventure… Citizens who seek for righteousness, good governance, and justice will only smile when you start to live for others and pose the positive influence that the society desperately needs. Thus I encourage you to go out there and knockdown our fiercest rival, that is, poverty! Strive to weaken poverty with all that you have been equipped with. Let the oak trees of righteousness grow, flourish, and prevail! As the time has come for you disperse throughout the nation, I expect you to fight the social evils that prevail and hinder the overall progress of the nation… all for the glory of God!” Its too bad we don’t hear graduation speeches like that in our country. If you want to make a difference in a third-world nation, I would recommend that you consider sponsoring an LDP student, or make a donation to the LDP educational fund. You can help young men and women like Beretek enter an ailing world full of injustice and become light, salt, and a blessing. Elelelelelelelele…Hallelujahs!